On Thursday night Golden Boy Promotions will present a card live at the Park Theater at the Monte Carlo in Las Vegas, Nevada on ESPN 2. At least two bouts are currently scheduled to take place. The co-main event will feature KeAndre Gibson taking on Alejandro Barrera in the welterweight division. 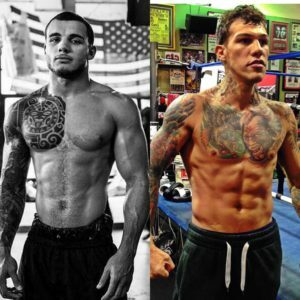 The main event will be a fight between Philadelphia’s Gabriel Rosado and New Jersey’s Glen Tapia in the middleweight division. Both Rosado and Tapia have been in the ring with some high profile opponents, and a loss for either will likely signal the end of meaningful matchups for either boxer. KeAndre Gibson was once considered a high level prospect due to his amateur background and success. He won the Junior Golden Gloves National Championship in 2006 and was a bronze medalist in the 2006 Junior Olympics. However, he lost by TKO to the undefeated Antonio Orozco in April of this year and some of Gibson’s hype has begun to fade. Gibson will be facing Alejandro Barrera, and opponent that is four years older than him but will have a five and a half inch reach advantage and stands at the same height. Barrera does not have the amateur experience of Gibson, but he does appear to have a slight edge in power. He has stopped seventeen of his opponents while Gibson has only stopped seven. Both men have suffered on stoppage loss in their career. Gibson has been fairly active the past two years. He already fought twice in 2017 and twice in 2016. Barrera only fought once in 2017 and zero times in 2016. Barrera has defeated the likes of Eddie Gomez, Juan Mantiel, and Armando Robles. His losses were to Errol Spence Jr., Ramses Agaton, and Armando Robles. Gibson has defeated the likes of Dennis Dauti, Mahonry Montes, and Jorge Romero. It should be noted that three of the past four fights of Barrera were split draws and very close on the scorecards. Gibson’s amateur experience and technical edge should make him the favorite, but he will have to be wary of the power of Barrera. The main event is between two guys known for their heart and willingness to leave it all in the ring, but are also known for coming up short when placed in big time fights. Glen “Jersey Boy” Tapia, will be giving up a half inch in height and about an inch and a half in reach to Gabriel Rosado. However, Tapia is four years younger than Rosado and has a considerable edge in amateur experience. Tapia has a claimed amateur record of 130-4 while Rosado is alleged to only having eleven fights as an amateur on his record. Both boxers have similar power numbers. Tapia has stopped fifteen of his opponents while Rosado has stopped thirteen. Both boxers have also been known to be stopped by their opponents. Tapia has three stoppage losses to his resume while Rosado has four. Tapia fought once in 2017 and once in 2016. He is currently riding a three fight losing streak. He has lost to the likes of Jason Quigley, David Lemieux, Michel Soro, and James Kirkland. Notable victories include Daniel Dawson, Donatas Bondorovas, Abraham Han, and Ayi Bruce. Roasdo has fought once in 2017 and twice in 2016. He has defeated the likes of Antonio Gutierrez, Joshua Clottey, Charles Whittaker, Sechew Powell, Jesus Soto Karass, and Ayi Bruce. His losses were to Martin Murray, Willie Monroe Jr., David Lemieux, Jermell Charlo, Peter Quillin, and Gennady Golovkin. Rosado has only gone 2-5 in his past seven fights, but most of those fights were against high level opponents. Both boxers have had their share of tough losses, but Tapia has suffered more devastating losses than Rosado and has not been as active. Additionally, Rosado’s losses were against some of the best in the business, including Gennady Golovkin and Jermell Charlo, while Tapia has lost to lesser known boxers such as Jason Quigley and Michel Soro. This should be an entertaining action packed bout. But it won’t be a bout to showcase the technical aspects of boxing. Rosado has an edge in the intangibles, but this is a fight that could go either way.